My first ever WWW Wednesday post! I’m reading waaaaay too many things right now (which is the biggest reason I’m taking up this meme—hopefully it will motivate me to have fewer CRs at one time!). As you can see, not only do I have too many current reads, but I’m not nearly far enough along in any of them, either! My goal for the week is to finish Small Spaces, Hark! The Herald Angels Scream, The Language of Thorns, Dear Heartbreak, The Gilded Wolves, The Sorrows, and The Truth About Forever. 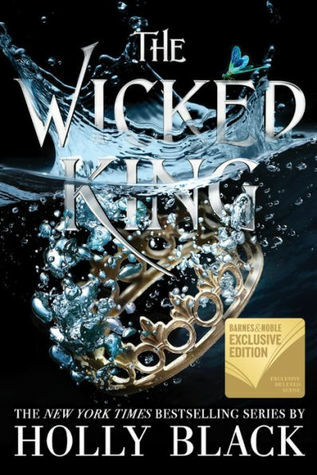 The only thing I’ve finished within the last week was The Wicked King, which you can read my review for here. With all those current reads, I don’t plan on adding too many things to my current reads this week! The only new title I plan on picking up in the next week is The Battle of the Labyrinth, which I’m buddy reading with my friend Sylwia, and The Lights, a new f/f YA horror novella eARC I just received. November Digital Haul: So Many Kindle Sales! OMG 10 books currently reading?! I need to breathe into a paper bag for you!!! LMAO this comment literally had me busting out laughing!! You totally should, it was REALLY fun to do! I could honestly see this becoming my new favorite weekly post! I usually try to limit myself to less than this, but for some reason in 2018 I have been so bad about constantly letting my current read number get up to 10-15, and I actually kind of hate it!! I need to stop. I think it’s mostly because I had such a bad slump the first part of November and so I kept picking up other things hoping they would fix the slump. I need to stop honestly!! I’m happiest when I have maybe 3-4 current reads so my goal for 2019 is that I’m literally just not going to allow myself to have more than maybe 5 at any given time. I’m almost done with Kingdom of Ash. It feels like I’ve been reading it for foreverrrrr. I’m hoping to finish it this weekend. *hoping* ahahah. Good luck with your pile! I think that’s what my brain is also telling me. Because I’ve either started/finished other books instead of just finishing KoA,hah! Thank you! I really hope so, too. I didn’t realize I was reading so many things until I did this post. I read The Truth About Forever back when I was in middle school and I remember really liking it and being a favorite. I need to do a re-read of it! It’s so good! It was one of my favorites as a kid and I read it soooo many times, but this is my first reread in years and I’m loving it all over again. Oh noooooo 😦 I’m so sorry you lost your copy, that’s so sad. I hate losing books! Oh my goodness. 10 at once. You legend! Hahaha thank you! I’m hoping next week’s update will be, like, FIVE at the most! Holy crap girl that’s a lot of currently reading! I can’t wait to see your thoughts on The Gilded Wolves; I’m dying to read it so badly! Haha it’s too many! I’ve got it down to 9 right now, I started a new one but have finished 2. I’m hoping to get it down to 5-6 by next Wednesday’s update. 🙂 and TGW has been pretty good so far! It’s one of the ones I’m hoping to finish today. Good luck trying to finish some books! You’ve got a crazy big pile. How do you decide which one to pick up? Happy reading and thanks for participating in WWW Wednesday! Hahaha thank you! I honestly don’t know but the funny thing is that I’m always so impressed by people who can read just one book at a time, I genuinely wish my attention span would allow that because then maybe it would be easier for me to review them right away! Ooh, you’re a good chunk into The Gilded Wolves already! Liking it so far? It’s alright! I love the characters but the world building is a little confusing? I’m hoping to finish it today and one of my buddy read partners said the ending is the best part so I’m pretty excited! I finished TLoT, so HA. 😂 it was one of my unhaul challenge picks and I was NOT unhauling that beauty so I finished it two nights ago. SO GOOD. I know this feeling so well right now. 😂 So my solution so far has mainly been to look at my current reads and say, “But I’m ___ far into this one, so I HAVE to finish it before picking up THAT!” and repeating. That’s the way to go! Especially with all the current reads you got going on, haha. 😛 I only have two and.. I keep reading on my Kindle even though – this ONE time – the ARC is the physical copy. -_- Stupid brain. I don’t do a very good job of it, sadly 😂 and thanks! I actually managed to finish TLOT a couple of nights ago and it was wonderful!! DESTINY OH MY GOSH! I can see why you needed to take this meme up, lol. I aspire to be able to read that many books at once. I lose track of where I’m at when I read more than two books. LOL!